Could someone please help me understand the purpose of the resistors and diodes used, and which grounds are what as I understand that the NME1215SC isolates each 0V. After looking at the comments and answers, I have come up with the following schematic. Does it look correct? Many thanks for your help with this! 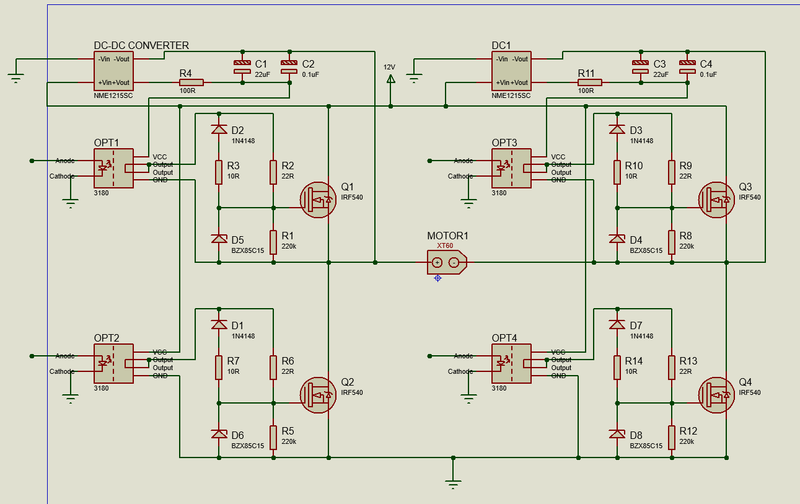 I don't understand why only one of the MOSFETS is being driven with 15V, and the other 12V. That DC-DC converter wasn't included because the high side MOSFET needs 15 V (it does not). The NME1215SC DC-DC converter module was selected because it is an isolated design, meaning that (like the optically isolated gate drivers) the power input is not electrically connected to the output. The idea is clearly to provide a floating power supply to the high side gate driver. Why does the gate driver need a floating power supply? Because in order to keep a N-channel MOSFET switched on, the gate voltage must be kept above the source voltage. This is a problem, since the MOSFET pulls its own source to the circuit supply voltage as it turns on, so the gate driver now has to supply 24 V (relative to ground) to the gate in order to keep the gate at 12 V relative to the drain. 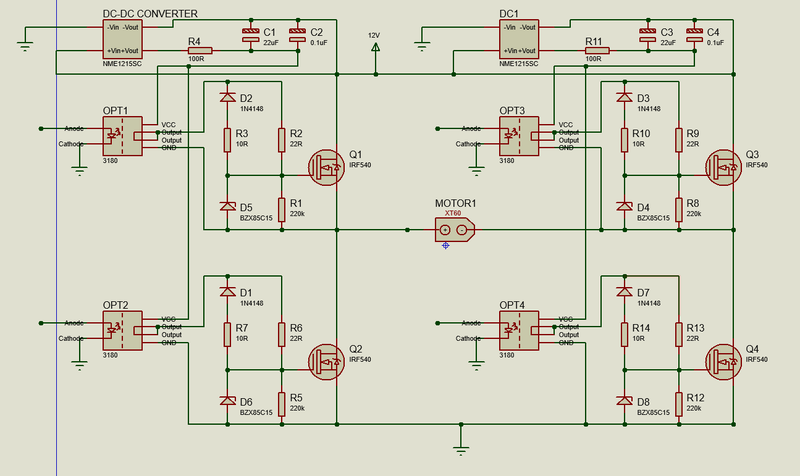 Your current design uses a single isolated DC-DC converter, which is shared for both of the high side gate drivers. This cannot be done, which should have been apparent when you had to short out the motor in order to draw the schematic. You need a dedicated isolated supply for each high side gate driver of the bridge, so two NME1215SCs. 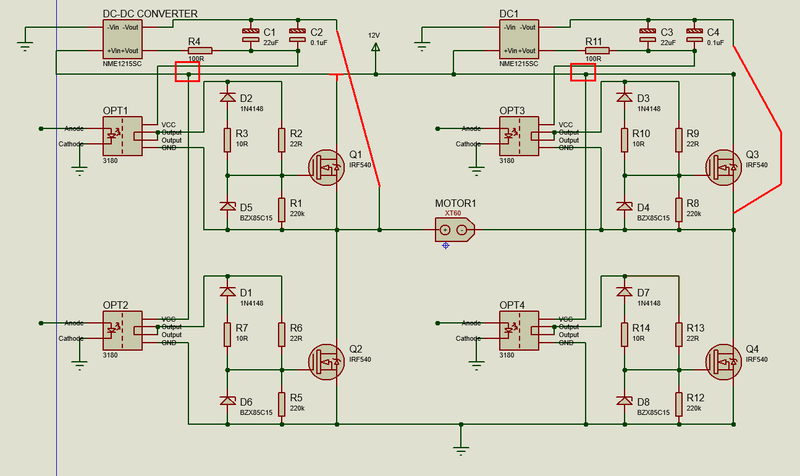 It's also possible to get rid of the isolated DC-DC converters entirely, and use a bootstrapping gate driver design. The idea is that every time the low side MOSFET is on, the negative supply pin (GND) of the gate driver is pulled to ground, allowing the 12V supply to charge the capacitor C1 via the diode D1. 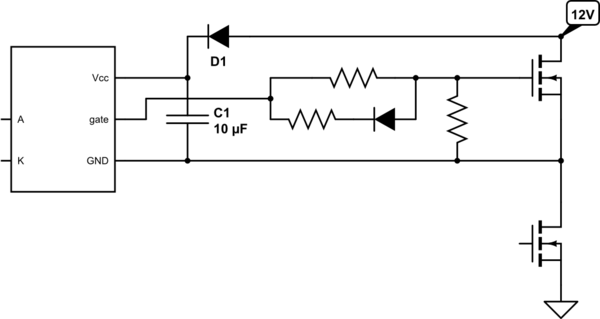 When the low side MOSFET is then turned off and the high side MOSFET turns on, the charge stored in C1 keeps the high side gate driver powered. The drawback of this is that you can't keep the high side MOSFET on continuously, because C1 eventually discharges too much if it isn't regurarly "topped up". This limits the maximum obtainable PWM duty cycle to somewhere around 98% or so (depending on the gate charge of the MOSFET, the PWM frequency and the quiescent current of the gate driver). The size of the capacitor in turn puts a limit on the minimum PWM frequency you can use. It is not just acceptable, it's beneficial as higher gate-source voltages (Vgs) reduce conduction losses. That said, you get diminishing returns raising Vgs, and even 12 V is a sufficient gate drive level. The IRF630 is a bad fit for the application. It's not only old, but also designed for withstanding an unnecessarily high voltage (200 V) which comes with a tradeoff - a poor drain-source on-state resistance (Rds(on)) of 400 mΩ and a current rating of just 6A. Modern low voltage MOSFETs are often below 1 mΩ, eliminating the need for a heatsink for many motor drivers. While 12V cordless drill motors tend to have no load currents on the order of 1.5 A, they can pull almost 100 A when stalled, which will annihilate IRF540s, not to speak of IRF640s. Unless you "soft start" the motor by gradually ramping up the average voltage (which you control with the PWM duty cycle), the starting current will rise near the stall current for a fraction of a second, potentially blowing the MOSFETs. 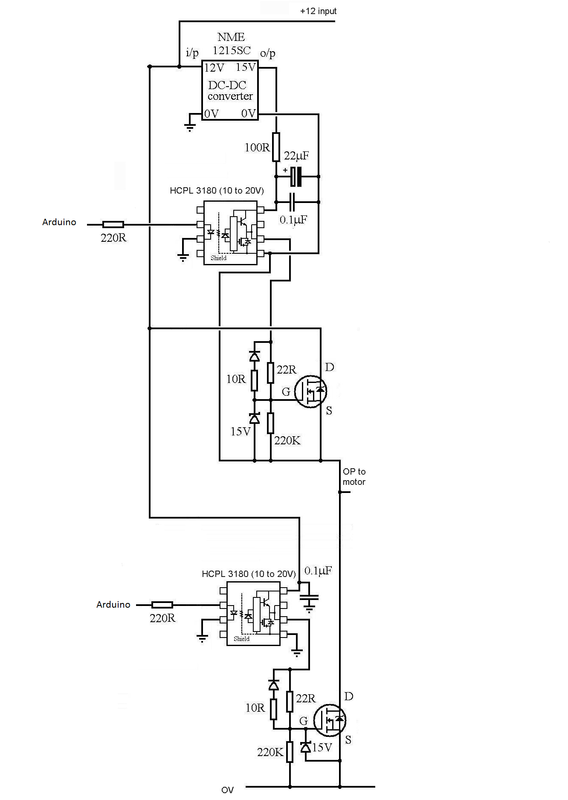 If not implementing overcurrent protection (sensing the motor current and reducing the voltage in response to overcurrent), in your application I'd use MOSFETs which are rated for 100 A or more, and 25 V or more. You can find good candidates (e.g. IRFB7440GPbF, STP200N3LL) using the parametric search of digikey, mouser, farnell etc. If those aren't available, you may connect several low spec MOSFETs in parallel (although each with its own gate resistor), as unlike BJTs MOSFETs will share the current nicely. The NME1215SC DC-to-DC converter needn't be a 15 volt output type; it could be a 12 volt output type and this would still work. So whether one power rail is 15 volts, both are 15 volts or both are 12 volts isn't really a ground shaker. 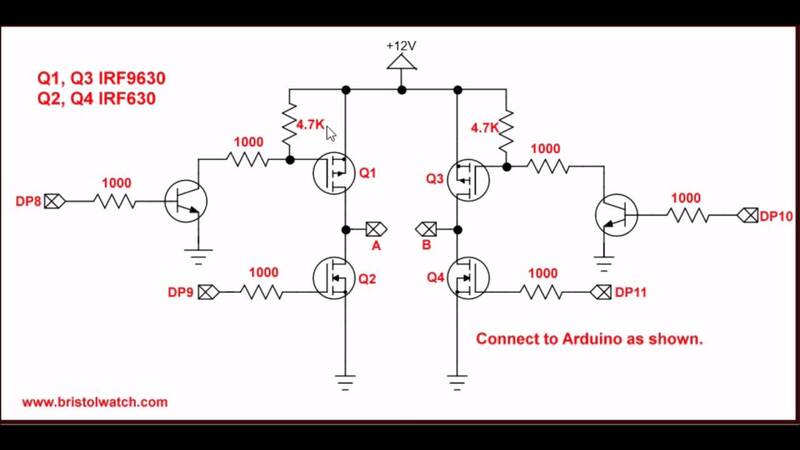 However, you do need to use an isolated DC converter in this type of design because you need to drive the top-side transistors at a gate-source voltage greater than the DC power rail voltage on their drains. This is because the top-side MOSFETs are connected as voltage followers and, to adequately ensure that they turn on to a low impedance (drain connected to source internally), the gate has to rise above the drain voltage by several volts. So the -Vout of the isolated DC converter MUST connect to the incoming 12 volts power (and drains). At the moment you have forgotten to make this connection so I urge you to correct this. However, it is probably better to use two DC converters with the -Vout connected to the output connection of each half bridge. EDIT - the maximum voltage that the HCPL3180 can take is 25 volts so, you will need two DC converters with each -Vout connection tied to their respective half bridge outputs. D4, D5, D6 and D8 are 15 volt zener diodes and these protect the gate-source from a possible over-voltage. To use zeners for this you need a series resistor and that is where the 22R resistors play a role - they limit current into the zener hence protecting them from overload. D2 and R3 (10 ohm) slightly increase the turn-off time of each MOSFET by extracting current from the gate capacitance a little quicker than what would be extracted by the 22R resistors. A lot of H-bridge designs probably would not bother with D2 and R3. The 220k resistors are to ensure that MOSFETs are turned off should power be removed i.e. they discharge the gate-source capacitance. Not the answer you're looking for? Browse other questions tagged mosfet dc-motor opto-isolator h-bridge motor-controller or ask your own question. why there are two capacitors in half H-bridge motor driver circuit?